Is Yahoo a good web host? Read our complete review on Yahoo web hosting here! - Promotion: $6.00/month for first 3 months! While Yahoo is a popular search engine on the Internet for a long time, but Yahoo web hosting division was established only on Year 2002. By riding on the widely popular brand, search engine marketing know-how and web hosting reliability experience, Yahoo web hosting has rapidly become one of the popular web hosting choice among many website owners. No wonder Yahoo! Small Business is now hosting more web sites than any other web hosting providers according to 'Tier 1 Research' with more than 1.5 millions customers worldwide. Yahoo web hosting does not come cheap. Pricing starts at US$11.99 per month (Promotion: $6.00 for first 3 months now) for their most high-end 'Premier' plan! It is expensive compare to many web hosting service providers recommended by us that some start at only US$2.99 per month. Yahoo Web Site Design Gallery - Build your site right in your web browser. This is a tool that helps you to create your web site easily with no HTML knowledge. Similar to many website creation tool offered by other web hosting providers, you can choose from more than 330 professional designed templates (with industry-specific layouts, high quality graphics and even e-commerce functionality) without starting from scratch. You get a great website without any coding. Best of all, you can create as many web pages as you like. See Yahoo! Web Site Design Gallery here! SpamGuard Plus - Applying the technical experience gained from providing the most popular free email on the Internet, Yahoo's SpamGuard Plus can ensure to eliminate 95% of junk email from your inbox. Moreover, all your emails are protected with advanced virus screening and cleaning technology. Search Engine Marketing - Being one of the top search engine on the net, you can be assured that Yahoo knows what is search engine marketing. When you sign-up with Yahoo web hosting, you will get exclusive discounts with $75 credit on search engine advertising through Microsoft AdCenter. In other words, you get $75 worth of free pay per click advertising. In addition, you will also get a free 'Referrer Reports' to help you to track where your customers are coming from that drive the most sales and traffic to your website. Search engine submission service - All Yahoo! web hosting customers can now enjoy Subminet's Search Engine Submission and Site Optimization Tools (a $47 value) for free up to 90 days. You can submit your web site to over 200 top global search engines and directories using Submitnet. Online Store - The 'Premier' plan does not support e-commerce feature. But, it can be integrated with the renowned Yahoo's merchant solutions, ' Merchant Starter' plan, easily to create your own online store. Yahoo provides various channels of customer service. With round-the-clock support, you can reach Yahoo's team of web hosting specialists by toll-free telephone or emails whenever you need it. While Yahoo did not provide much information about their data center, but you can be assured that Yahoo will devote considerable resources to provide a highly reliable facilities to ensure maximum uptimes. Moreover, with all the technical experience of running it's own Yahoo! search engine web site (one of the busiest web site on net), you can be certain that Yahoo would not compromise on the reliability issue.
" SiteBuilder is by far the easiest to use and you get exactly what you want. The ease of use of SiteBuilder and the reliability of Small Business Web Hosting has really made creating this site a pleasure. " " Yahoo! SiteBuilder is easy to use. Though the tech support is there, I've never needed. " 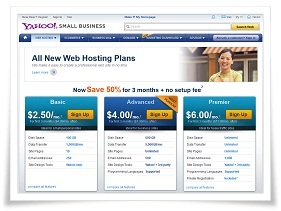 How does Yahoo web hosting stacks up? The Yahoo 'Premier' web hosting plan, even though comes with unlimited disk space and bandwidth with some constraints, is a basic solution with weak features. Not to mention the monthly price of US$11.99 ($6.00/month for first 3 months, thereafter $11.99 per month) that does not come cheap compared to many other cheap web hosting recommended by us. Strong branding aside, Yahoo web hosting plan is not going to steal the advanced webmasters crowd. More likely, the Yahoo web hosting will capture the attention of webmasters who are new to creating an online store, or those who want the brand of Yahoo that signify reliability and trustworthy, which explains why Yahoo web hosting has been such a hit in the web hosting industry. If you appreciate the better brand awareness and trustworthiness of Yahoo web hosting, it may be worth the extra to you.